"When I go into the garden, I forget everything. It's uncomplicated in my world of gardening. It's trial and error, really. If something doesn't work, it comes out, and you start all over again." Aeroponics: Build this Easy System! Just what is aeroponics? 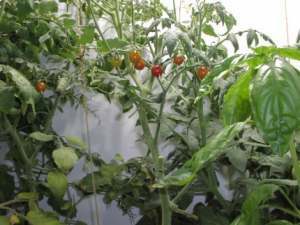 With this advanced hydroponics technique, you forgo the use of not only soil, but also traditional hydroponic growing media like Hydroton or Coco coir. Instead, the plants roots are suspended in the air (in a closed chamber) and nourished by a fine misting of nutrient solution. This provides for an extensive hairlike root base and lush plant/crop growth. Sounds ideal, right? 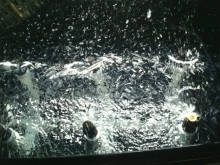 Well, there is a drawback to the aeroponic system. Since there is nothing surrounding the roots to help hold moisture, if the electricity goes off, your plants will die... and rather quickly. if the power outage is short, you could save your plants by hand misting the roots with a spray bottle and clean water. Long-term without electricity? If you want to go this route, invest in a small gas generator to run the aeroponic misting pump. 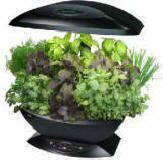 Hydroponic Herb Garden in your kitchen! Once you have tried the savory taste of home-grown herbs, you will never go back to bottled spices! We highly recommend this sturdy unit for home culinary herb production. We keep one year-round on the kitchen counter, planted with our favorite cookin' spices... like oregano, chives, basil and mint. Read more about this hydroponic herb garden here: https://www.hydroponics-simplified.com/indoor-herb-garden.html. Have fun! Hydro Tip of the Month- Which nutrient solution should I choose? We heartily recommend General Hydroponics Flora nutrients system. The products are superior, cheap, and easy to find. Once you get set up, don't forget our Flora mixing chart. Simply print it out and tape it to the wall of your grow room.